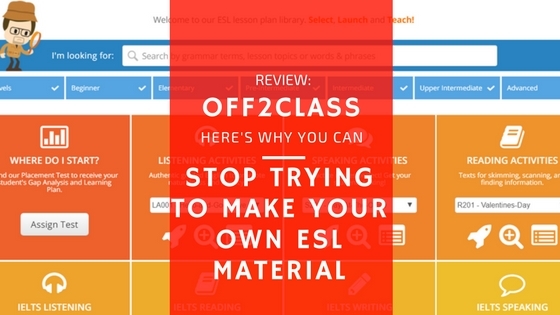 Off2Class Review: Never Make English as a Second Language Lesson Plans Again! Coming up with interesting and effective English as a Second Language lesson plans and materials. How do I know what to teach them, what order do I teach it in, and do I really have to create this all myself? We’re looking to reduce stress, gain time, and increase our level of confidence and professionalism when giving online ESL lessons. The best tool I’ve found to accomplish this is Off2Class. A big challenge when teaching ESL/EFL is English-language learners tend to have varying levels of proficiency. How are we supposed to know where to start and what to teach each student? Luckily, Off2Class offers a solution to this in the form of a thorough ESL Placement Test to send current or potential students. The test assesses your students’ reading, writing, listening, and even speaking skills to create a Gap Analysis and estimated Language Level. It also generates an individual Learning Plan based on the questions answered incorrectly. That’s right: you’ll know the exact lesson content from the library you’ll teach to fill in your students’ gaps in English use. Plus, you can track each student’s progress using the built-in student management system. This was one of the biggest selling points for me to join, and it’s also an excellent selling point when trying to get new students, as you can demonstrate the exact plan you’ll use to help them improve. Just send them the Placement Test via email and share the results and Gap Analysis with them during a trial lesson. Instead of throwing out ideas for lesson ideas, you can confidently share your plan and the lessons you’ll teach-just like a professional who knows what they’re doing. Now, what are these lessons you ask? The Off2Class lesson library contains hundreds of ESL lesson plans designed by ESL teachers who could not find materials that met their standards. Each lesson contains teacher notes to guide you and to provide a framework for a professional lesson. Additionally, most have homework assignments you can assign to reinforce what you’ve taught in class. The lessons cover everything from the alphabet to business English to exam preparation, like the IELTS or TOEFL exams. You’ll log in, your student will log in, you can share your screen, and you both can make changes to the lesson slides. These lessons work with any videoconferencing system that allows you to share your screen, like Skype or Zoom. Off2Class understands no two students are the same. You can preload the Canvas tool, which is a blank slide, with images, videos, and text to enhance each lesson with content specific to your students’ interests. Don’t see a topic you want to teach? The team members at Off2Class encourage collaboration and welcome suggestions for new materials. They are always adding new lessons, so the library is always growing. Alternatively, each lesson can be altered and adapted to fit your students’ specific needs. During the interactive lessons, your student can even type and make changes directly to the materials! By leaving the lesson planning to Off2Class, you reduce stress and free up more time to focus on your students. If you look at the chart below you can see Off2Class offers a range of options for customization depending on your needs. This can be upgraded when those needs change and include branding the materials with your own logo and having your own domain name. Remember I mentioned James and Kris encourage interaction and collaboration? Just look at the teacher training you get as a part of the professional and business plans. They also run additional live group training to demonstrate how best to teach new lessons when they are released. You can find replays of past training and other tips on their blog here at Off2Class.com. Next, you can also select your subscription level based on your number of students. Options start at $5.50/month when you purchase a yearly subscription. In other words, you can pay for your subscription with a single lesson. Test-drive a subscription free for 30 days, and you can keep access to their fun ESL games even if you don’t continue with a subscription. You are reducing stress, gaining time, and increasing your level of confidence and professionalism by offering students a structured and effective plan for improving their English-language proficiency. To gain and retain students, we need to develop trust and inspire confidence in our abilities to help them learn. I’ve found Off2Class allows me to do this and gives me more time to enjoy the teaching experience. Teach Nomadic Members enjoy $5 off their first payment! This entry was posted in Best Tools For Teaching Online, How to Teach Online and tagged efl, esl, esl resources, lessons, materials, off2class, tesol. Bookmark the permalink. ← How to Get Clients and Students Online Today! Thanks for the information on Off2Class! What ages would you recommend this program for? Thanks for the question! Although the information in the lessons is designed for adolescents and above, the most recent post on the blog at Off2Class includes a webinar about how to adapt it for younger learners. You can check it out here: https://www.off2class.com/adapt-off2class-for-young-learners-webinar/. My mom wants me to find some good English Lesson plans for her and she needs some IELTS exam plans as well. She also mentioned Off2Class before. So I guess I will sign up for it. I’m certain she’ll be satisfied with the range of lessons at Off2Class. They have excellent IELTS preparation lessons as well, which I used to use with my one-to-one students. For some more IELTS preparation strategies and information, you can check out http://www.awakenielts.com. I have so many friends who teach abroad, and all of them have one thing in common: they don’t know where to go for ideas! I’ll pass them this website. The trial is at least worth trying. Thanks for the share!! Awesome, Marina! Let them know they can always contact me here if they have any questions at all about Off2Class. I couldn’t imagine teaching without those lessons, and the students love that they get homework to practice as well and can track their progress. And you’re right, why not test the free trial out? Nothing to lose! Thanks for sharing 🙂 Cheers! Our church is considering Off2Class for teaching our adult ESL classes. We want to ensure the program is appropriate for church use- no offensive language, or promotion of issues that conflict with Biblical doctrine such as adultery, homosexuality, witchcraft, etc..
Are you aware of any fundamentalist churches that currently use the program ? Do you know of any program reviews written from a Christian perspective ? You might find the lesson titled ‘I Don’t Believe in God’ unsuitable. Similarly, you may not want to use the lesson on the history of Halloween. But what’s great about Off2Class is that it allows the instructor to select which lessons to teach and avoid those that he or she feels uncomfortable teaching. ‘The Off2Class content team endeavors to write lesson content that allows educators and instructors to choose material which suits them and their students. A wide range of topics and ideas are presented, though for any user with particular beliefs, he or she may simply choose to avoid lessons that he or she may consider inappropriate. Lessons that mention alcohol and pork have an annotation on the lesson notes, as do lessons that discuss controversial topics. If the user possesses a restricted set of values that may be at odds with an international liberal worldview, we suggest the user take the time to examine lessons before teaching them. As educators, we have a duty to write content about everyone and everything; it is up to the individual user to decide whether to teach that content. We do not promote any lifestyle or beliefs as being the correct one. Obviously, fundamentalist Christian teachers will avoid the lessons on equality, atheism, astrology, etc. The category of speaking lessons denoted as controversial will be unsuitable. In total, I imagine that 620 of the 700 lessons on the site are suitable for a fundamentalist belief, but that is an estimate. I’m aware of a number of churches currently using the program to teach their students, although I do not know if they are fundamentalist churches. Luckily, the 30-day free trial can help you get sorted. Hello! My students don’t have electronic devices, so I am wondering if I can get the minimal plan (2 students per month) and simply use refer to the lessons and the power points? Also, can I print off the homework assignments and other practice activities? Thank you! You can definitely get the minimal plan and teach the entire class from that, and many of the activities can be done with them as well by taking turns to answer questions or playing the interactive learning games. I’ve used it in this way with small group classes before where my lessons supplemented other coursework and materials they already had. But if they have any kind of electronic devices at home, even smartphones, they’ll also be able to complete the homework. Alternatively, kids at an elementary school I worked at have designated time in the computer lab where they would complete the individual practice exercises/homework assignments online. You could also use the digital assignments as guides to create your own unique assignments on paper I suppose. That would still save you some time in the planning process. Have you asked the Off2Class team about the custom packages they offer for schools? This might help out with the cost to try the computer lab strategy. I hope this helped a bit, and thanks very much for your question! This was a pretty good review. I have been wondering about signing up with Off2Class for a while. I quite like making my own lessons, but it would be nice to have a big supply of ready made ones. I do have a question, though, for the author or anyone here who has used it: Is it easy for the student to log in and get started? It was very simple in my experience to get them set up and logged in. The setup is pretty self-explanatory, and for the sign-in and classroom interaction, I shot a quick walkthrough once that I could send out to all future students, then made sure they were comfortable with it during the first few minutes of our first lesson. I haven’t used it in a while because I’m teaching much less and using a company’s materials, but if I were, without a doubt I’d still have Off2Class. The guys behind it are very active and constantly improve and update the platform and its content. They may have better info on their site about onboarding new students, and I’m sure they’d be happy to answer any other questions you might have :).